In order to offer you the family that best meets your expectations, share your wishes with us. iLP is committed to offering you a family who will make your stay enjoyable. The families are carefully selected and offer quality accommodation in terms of comfort and location (at the most, 30 minutes away by public transport). To ensure that students are hosted in the best conditions, iLP regularly visits them. Host families have signed a contract and have worked with iLP for several years. 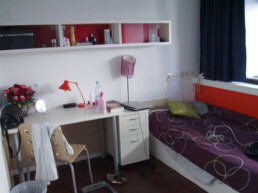 They are used to hosting foreign students and adapt to their specific needs. Share your wishes with us and indicate any allergies or dietary requirements. iLP offers a single or double room if you are coming as a couple, with half-board. Breakfast and dinner are taken with your hosts. The meals are a great opportunity for discussions. This form of accommodation is recommended as it allows the language to be practiced intensively in a friendly context and discovery of the French lifestyle. It is obligatory for unaccompanied minors. We also offer this form of accommodation with full-board. In addition to breakfast and dinner, your hosts will prepare a packed lunch for you. Bed and breakfast: you will stay with a host family in a single or double room if you are coming as a couple. You will take breakfast with your hosts and your meals away from home, and will not have access to the kitchen. iLP will recommend good deals for discovering French cuisine. Room with access to the kitchen: you will stay with a host family in a single or double room if you are coming as a couple. You will use the kitchen at certain times agreed with your hosts. The families are carefully selected based on the quality of accommodation, in terms of comfort and location (at the most, 30 minutes away by public transport). Host families are used to receiving students from around the world. They welcome students upon their arrival and accompany them on their day of departure. On the first day of classes, they take them to iLP. During the confirmation of registration, iLP will send you information on the family as well as an accommodation contract. Two weeks before your arrival, you will contact your family to indicate the day and time of your arrival. They will meet you at Montpellier station, bus station or airport (service offered from 8:00 to 23:00). The arrival will be on a Sunday afternoon and departure on Saturday morning. On the first day of classes, you will complete a questionnaire on your family and iLP will take your remarks into consideration. A change of family may be considered. During your stay, our accommodation manager will answer your questions and facilitate your communication with the family. At the end of your stay, iLP will ask you to complete a form in order to learn your impressions and share them with the host family. Je me suis amusé à iLP et après quatre semaines je suis arrivé au niveau B1. Maintenant, je peux communiquer en français sans problème.